Inbound marketing is a tactic that attracts customers through positive and helpful content and interactions. Unlike outbound marketing, which fights for customers’ attention, potential customers find you through organic outlets such as social media, keyword-rich blogs, and search engines. When you design content made to address the needs of your ideal customers, you build a relationship with them built on trust and credibility for your business. Good content is the keystone of inbound marketing. Tailoring your content to match the wants and needs of your ideal customers is a surefire way to lead them right to you. By personalizing your messages to them, it naturally attracts them to your pages. You can generate your own content by writing relevant blogs and posts or by sharing relevant content from different corners of the web. Make sure to pay close attention as these needs and wants naturally change over time. As your customers’ needs change, be sure to tailor your content to continually match them. What’s the difference between inbound marketing and outbound marketing? In today’s fast-paced, information-heavy world, outbound marketing is becoming more and more ineffective. Outbound marketing, or traditional marketing, is the old cycle of buying ads and email lists and hoping you get a lead. This doesn’t work! Inbound marketing speaks to your customer and gradually leads them towards you instead of just hoping to attract them through an intriguing ad. Inbound marketing also gives you the opportunity to get to know your customer better. Outbound marketing is a monologue. You speak to them without giving them a chance to speak back. Inbound marketing is a dialogue. Together with your customers, you take the time to find what works best for you while keeping their needs at the forefront of your thoughts. There are so many aspects of inbound marketing that makes it so effective. Listening to your customer shows that you care about them. Adapting your content to things they want and need shows that you are willing to work for them. They will reward you for your efforts by becoming lasting customers. This is the strategy of successful businesses. Inbound marketing is the most effective strategy for doing business online. It centralizes around your relationship with your ideal customers and sells your product or service through quality content your customers can relate to. When you align your content with the needs of your customers, you naturally attract inbound traffic that you will be able to turn into lasting customers. Building trust with them is the foundation of a lasting relationship. The goal should be to help your customers and believe that your help convinces them that your business will be an asset to them and make their lives easier. Inbound marketing allows you to provide all the necessary information and empower the customer to buy when they are ready. This process takes time. Trust and reliability does not happen overnight. How do I create a strong strategy? 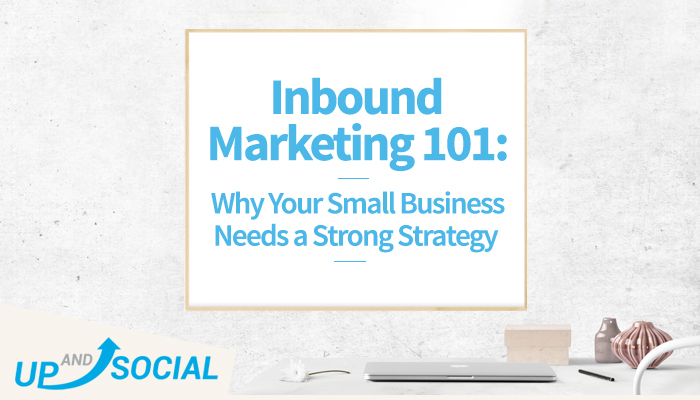 In order to have a strong inbound marketing strategy, you must be able to identify the needs, interests and basic questions of your potential customers. This can be done through market research and getting feedback from current customers. From there you will be able to create and find relevant content that they will find useful. Do not make the mistake of creating the content you think that they want. Be sure to take the time to produce the things you know they want. Next, it’s time to spread your content far and wide. Get people excited about your content! Create exciting social media posts paired with pictures and other media. Respond to customers when they mention you in a tweet or Facebook comment. Make a “Blog” tab on your interactive website. Be creative with the way you distribute your material. Keep it relevant and keep it coming. Up And Social specializes in cultivating strong inbound marketing for our clients. We do the research, create the content and make sure you are seeing results. Our inbound marketing services include website design, search engine optimization, and social media. To contact us or find out the other services we provide, click here.